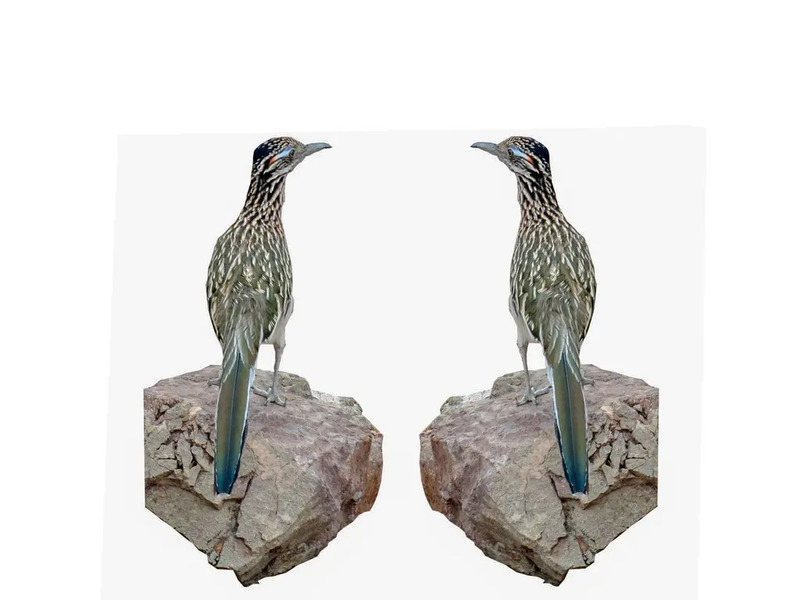 Greater Roadrunner Bird Photo, Roadrunner Photo *** ALL photos are free, just click on a photo, enter the quantity, then download through the cart, after signing up for the newsletter. Greater Roadrunner bird standing on rock isolated on white in Arizona. This is a young roadrunner. He is considerably smaller than a full grown one. This year we had much more rain than usual in the summer so there are a lot more roadrunners. Roadrunners are members of the cuckoo family. When they walk two toes are pointing forward and two are pointing backward. They can be up to two feet long, so they are about twice as big as Yellow-Billed Cuckcoos that live in Az, New Mexico, Nevada and Utah. They sound like a dove when they make their coos six or eight times. They are found in the southwest US down into central Mexico. They like dry or desert areas but not higher areas. They like lizards, snakes, scorpians, beetles, small birds, eggs and small mammals. Thus they are birds of prey. An old Yaqui indian man told me he had seen a roadrunneer find a sleeping rattler, build a wall around it with pebbles and twigs, leave an opening for the snake to crawl out. Then the bird would stand in front of the opening flap its wings to wake up the rattler and as it crawled out the narrow opening use its long powerful beak to peck the rattler in the head. 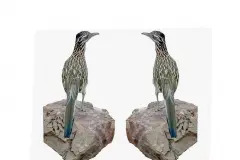 The Greater Roadrunner is white with dark brown stripes. Its crown or head is dark brown and can appear fluffy when the bird is on alert or moving quickly. It has blue and red skin behind yellow eyes. With its long wedge shaped tail, long legs and striking crown feathers it does appear cuckcoo when running. They are considered a vertebrate species. Arizona Images Free – You can download the Roadrunner full size photo here free of charge. Backyard Cam Photos – See another Roadrunner here.